World Food Program (WFP) USA supports the United Nations’ World Food Programme, the leading humanitarian agency fighting global hunger. From providing school meals to impoverished communities, to connecting small-scale farmers to local resources, to helping communities rebuild after natural disasters and humanitarian crises, the World Food Programme works on the front lines to eradicate world hunger. WFP USA activates new and existing donors, bipartisan policy makers, and a broad community of advocates in the United States to ensure the world’s most vulnerable have access to nutritious food. In 2016, the organization saw an opportunity to make its overall digital experience a more effective tool in inspiring these audiences to be part of the solution. WFP USA needed a way to explain the complexities of hunger and inspire audiences to join the global movement to end it. However, its content was poorly organized and labeled, making it difficult for users to explore and share. Audiences also lacked a clear understanding of the relationship between WFP USA and the United Nations World Food Programme. As a result, WFP USA was missing opportunities to engage an American audience and seek its critical support. 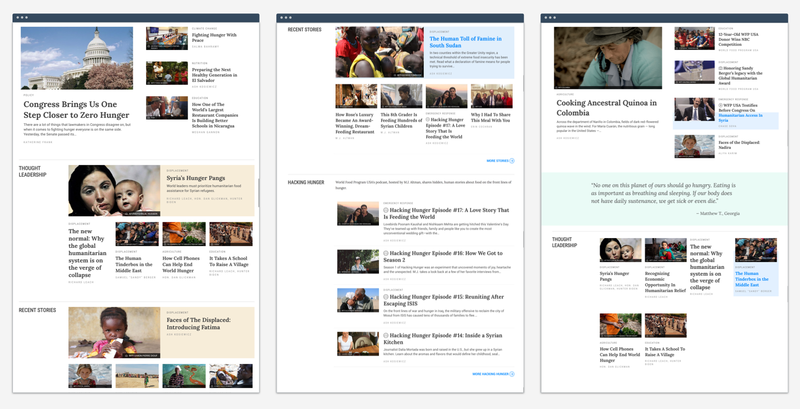 At the same time, a rigid content management system (CMS) limited WFP USA’s ability to provide audiences with relevant and inspiring content and the ability to react quickly in crises. This made multimedia projects especially challenging to feature on the site. Most importantly, the donation experience was inconsistent, troublesome on small devices, and lacked the transparency necessary to increase individual donations—the single largest source of revenue for WFP USA. 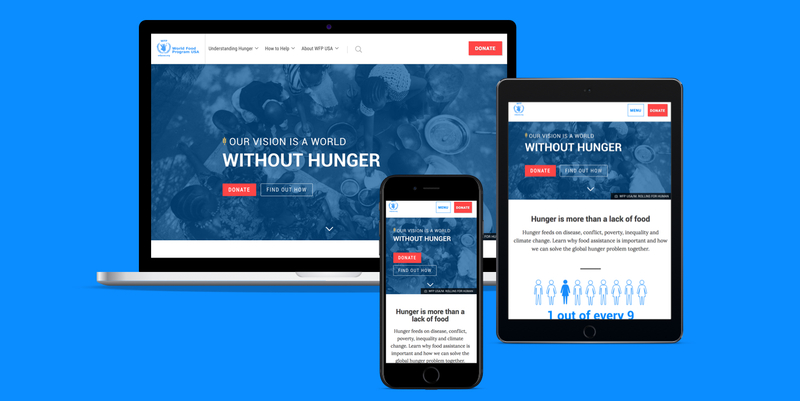 Atlantic 57 helped WFP USA transform its website into a powerful asset in the fight against world hunger. From the beginning, we took an iterative approach to design and development. We agreed to launch with a website we could refine and build out over time, incorporating feedback from users. This helped everyone to focus on and prioritize what was truly necessary at every step. Our work began with stakeholder interviews, a content and analytics review, and a user survey. This original research helped us to better understand WFP USA’s existing audiences and what compels them to donate. We used these insights to develop an information architecture and an on-site experience that prioritizes the information users want, value, and need. It is imperative that all site visitors understand WFP USA’s mission, charity status, and role in furthering America’s support for the United Nations World Food Programme. In an effort to show American donors where their money is going—and all the ways they are tangibly making a difference—we provided easy access to WFP USA’s financial information and policy work. We positioned this content alongside insight into what the World Food Programme does, including the types of food and assistance it delivers on the ground. Hunger is a complex problem. We built WFP USA’s new site to bring clarity to the challenges of feeding populations across the globe through stories, videos, podcasts, and photo essays. The new design also celebrates those actively working to fight hunger every day to inspire Americans with the effect they can have and the progress yet to be made. We built a powerful tool that allows editors to react quickly in the case of a crisis and test and adapt messaging over time. Content can be created and managed in a single place, while dynamically powering a variety of experiences throughout the site. Adjustable templates and pages can be arranged in different ways to deliver the best possible presentation. Because the CMS allows for editing of almost all aspects of the site, it greatly reduces the need for developer support in content management. Thank you for designing and executing a beautiful website for WFP USA. But it’s bigger than just having a pretty site, it’s having a site that is functional and that means meeting our technical, fundraising and content needs. That’s huge for us. For WFP USA, no action is more critical to its cause than donating. Recognizing that individual donor relationships are built on trust, we placed a heavy emphasis on clarity, transparency, and accessibility across the site. This emphasis positioned WFP USA as an accountable leader in the fight against hunger. We created new opportunities to tell people, in clear and concise terms, how to help and why their support is needed. Finally, we provided ways for WFP USA to prominently surface the donation button throughout its site. We made the button consistently recognizable and free of any surrounding distractions.